British Columbia’s Chris Crisologo makes his return to the national team for a second year. Hailing from Richmond, Crisologo earned his spot on the strength of two impressive victories at the B.C. Amateur and South American Amateur. 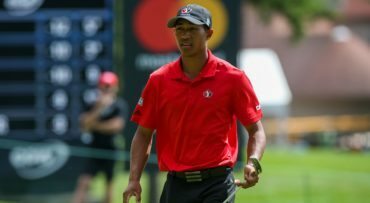 The Simon Fraser University alumnus also turned heads at the 2018 RBC Canadian Open, capturing the Gary Cowan award as the low amateur in a tie for 45th. Crisologo is the youngest player on the men’s team. My dad thought it’d be a good idea to introduce me to all sports and I ended up picking golf. Three blue dots under the number, purple line or arrow. A wall mural in Vancouver. The scenic views and hikes around the city. My high school bad tag from Vancouver College (it’s the only tag I put on my bag).